Kara has quite the creative gene, and had a lot of fun coming up with some new designs. I wasn't sure how this egg was going to turn out.. 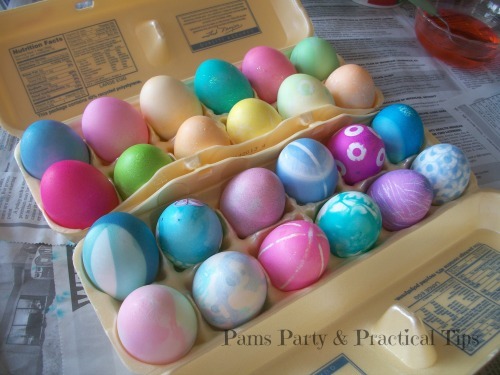 In the past we have used notebook paper reinforcement circles on our eggs, but never this many. She covered the entire egg with the stickers and then put it in the blue dye. Once the dye had dried, she removed the stickers, and this is how it turned out. This egg is definitely one of my favorites this year. 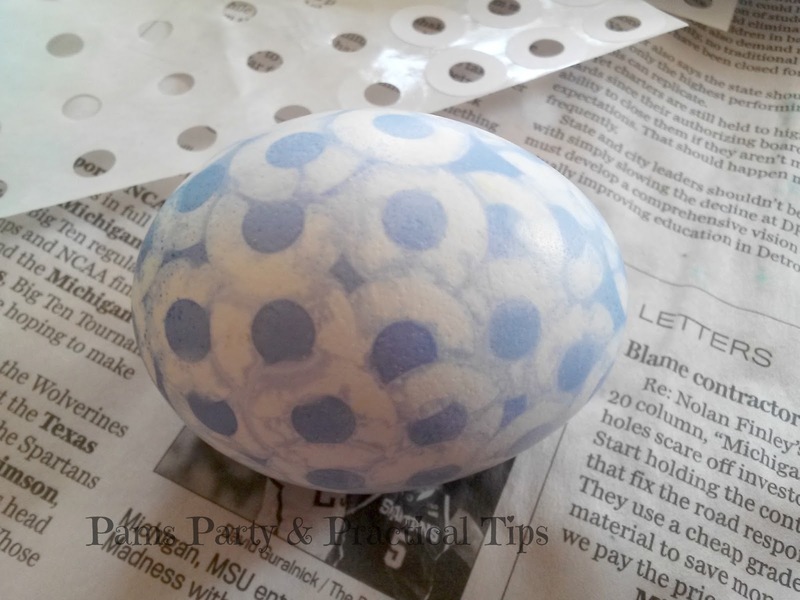 Kara used the wax crayon that came in the kit on this egg. 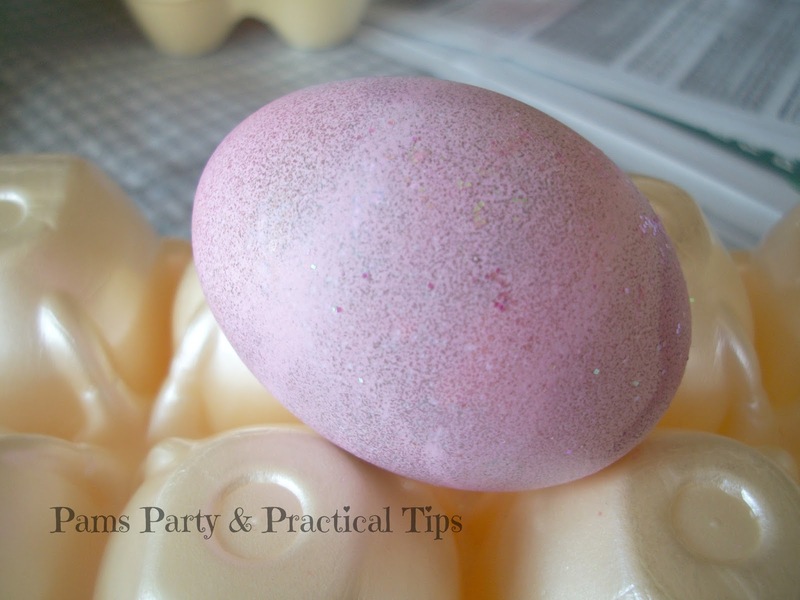 She then dipped the egg into the purple dye, and rubbed on some pink. 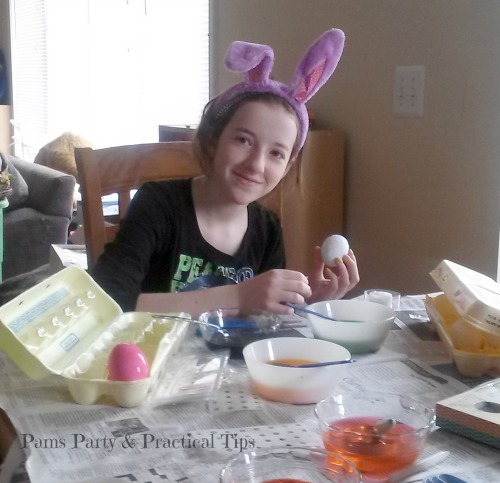 When she started taping an egg, I was not really sure what she was trying to do. 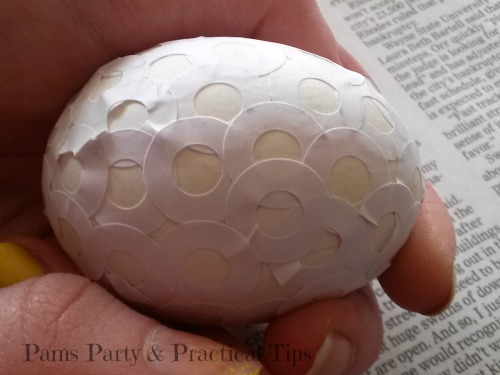 The tape was messy and crinkled, and placed randomly on the egg. She placed it in the teal blue dye. She removed the tape once the dye had dried.. Again it turned out with a really cool design. 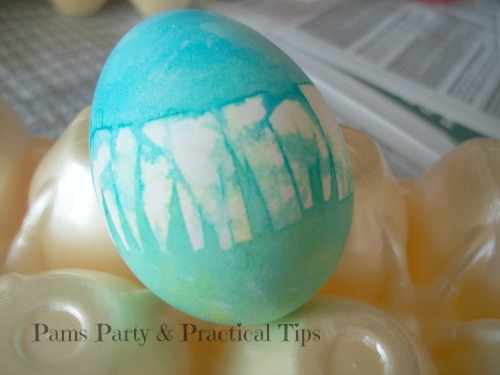 She also used tape on this egg. This time she cut random snips around the bottom of the piece of the tape, so that it would resemble pieces of grass. 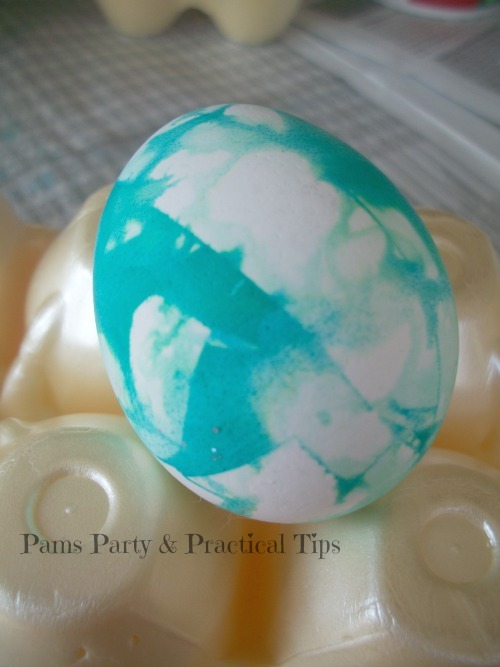 She wrapped the tape around the entire of the egg, and then dipped the bottom of the egg into the green dye. 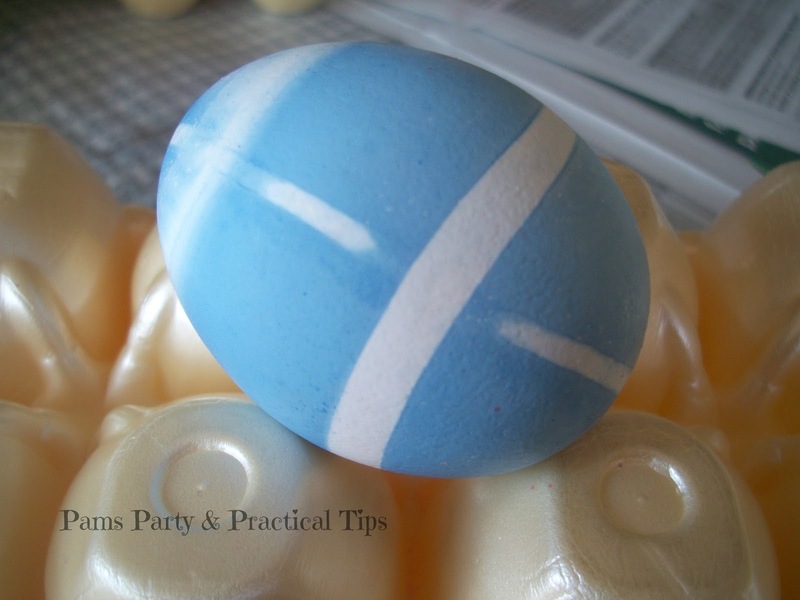 Once that was dry, she dipped the top part of the egg in the teal blue dye. I think she accidentally dropped the entire egg for a second so some of the blue got on the green, but it still turned out with a fun design when she removed the tape. Kara made the egg on the left, and Kyle made the egg on the right. 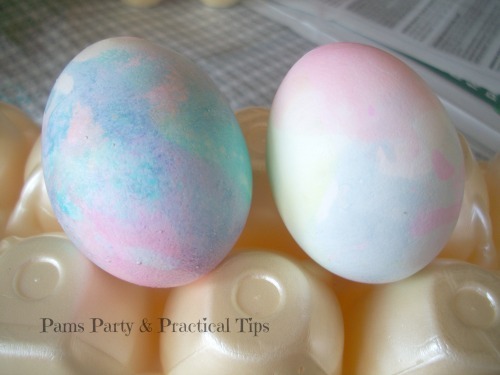 Both have a pretty tye dye look, and each used a different method.. Kara dipped her finger in the dye and then painted the colors on the egg in random places. Kyle dipped different parts of the egg into a color, and then quickly wiped off the excess. Both of the eggs turned out to be quite colorful. Kristina made this egg.. She dipped it in the pink dye, and then quickly into the purple. While she was sprinkling on the glitter, she accidentally dropped it on the paper plate she was using to hold the glitter. The mix of pink, purple, and glitter turned out to be quite pretty all together. I made this egg. 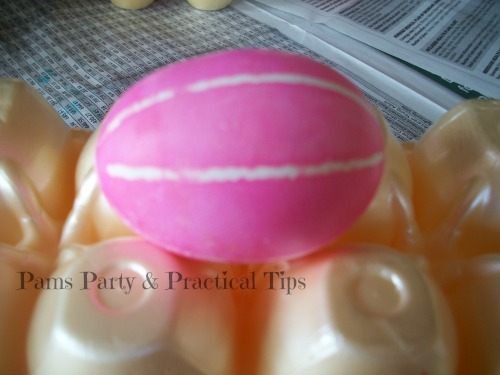 I wrapped thin rubber bands around the egg lengthwise, and then dipped it into the pink dye. 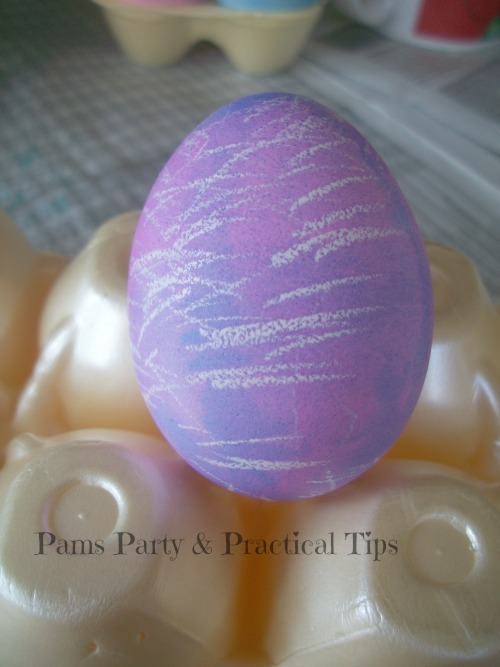 When the dye dried, I removed the rubber bands and the egg had this pretty striped effect. I used a wider rubber band to make the design on this egg. It was hard to get a good picture of this egg. Kara would sit the egg in the dye for a few seconds. 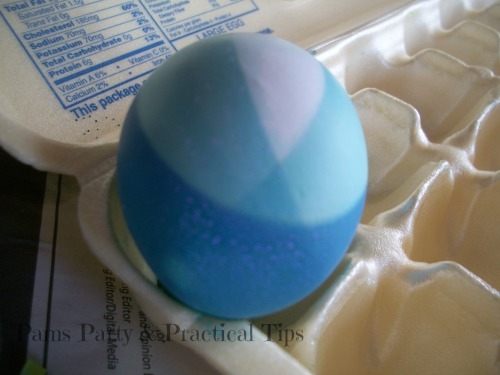 Then she would turn the egg, so the the next layer would be darker and in a different position. It is definitely different than all of our other Easter eggs this year. I hope you like our new designs, and maybe even try them while dying your own eggs.. Happy Easter Pam thanks for dinner! !